In early-September, The Mountaineers hosted a week-long celebration of a monumental accomplishment from 40 years ago: the first American ascent of K2. The festivities involved many events, including a luncheon for 50-year members, a team-reunion anniversary celebration, an outdoor film, and a special edition of Beta & Brews. Collectively these events shaped an unforgettable experience. It started with a phone call. Jim Whittaker, best known as the first American to summit Mt. Everest, had an idea. In 1978 'Big Jim' led the first Americans to the top of K2, and wanted to get his ’78 team back together, 40 years to the day of the summit. As a visionary leader, Jim knew the reunion would be a gathering for the ages and wanted to share the excitement with the community that supported him. Jim started climbing with us when he was fifteen, and as a lifelong Mountaineer he saw an opportunity to promote The Mountaineers, with all proceeds benefiting our nonprofit. We were honored and quick to agree. 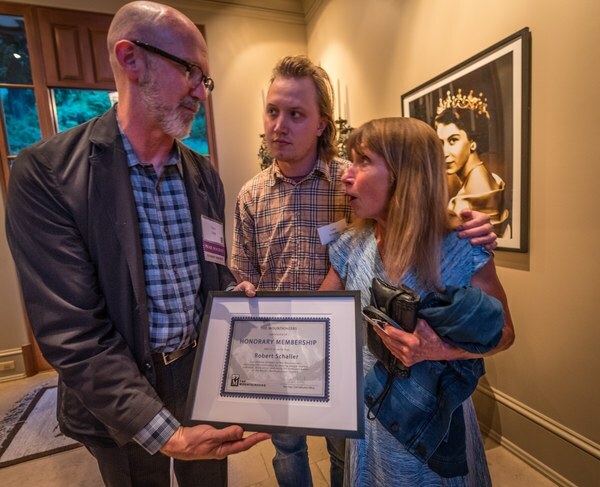 We opted to celebrate in a week-long affair with a variety of events that would appeal to our members, donors, and supporters, and with options that would be accessible to everyone. Before we knew it, everything sold out! With the help of our lead sponsors, REI Co-op and Vibram, we set forth to ensure the best experiences possible—stories, photographs, tears, and all. We launched the K2 series with an annual Mountaineers gathering: the 50-year membership luncheon, but with a K2 twist. To honor all of our members who have been with us for over fifty years, we had a special keynote speaker from the 1978 team, Bill Sumner. 50-year members enjoying catching up before Sumner’s keynote speech. By Tyler Dunning. Bill Sumner discussing K2. By Tyler Dunning. 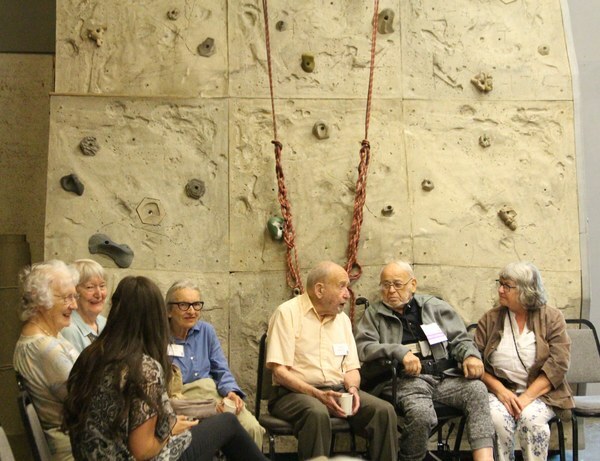 Our 50-year members enjoyed a social hour to mingle, reconnect, and share stories from decades spent in the great outdoors. 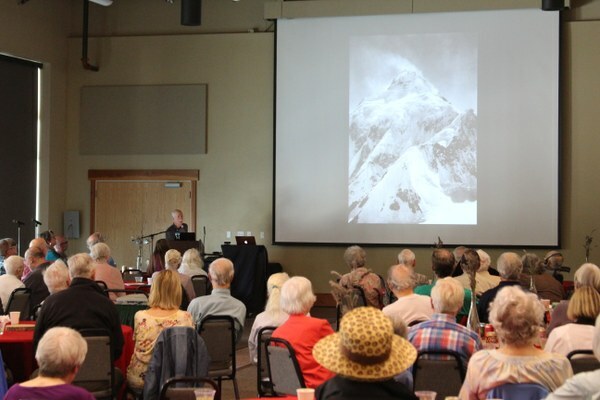 Then, over a catered meal, Bill Sumner shared his stories of K2 and wowed the nearly 100 attendees with his slideshow recounting his 67-days above tree line, from the high-altitude trials he faced to the sweet success assisting his team to the top. 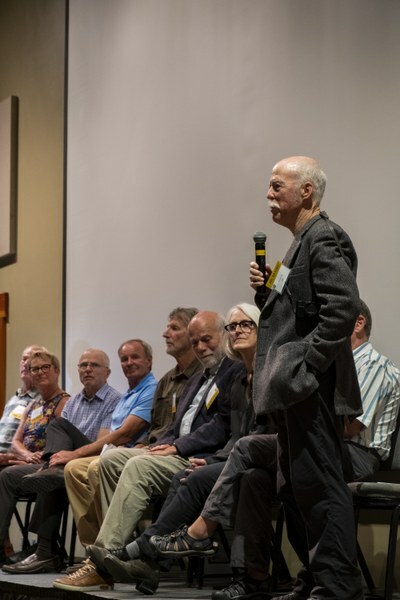 Attendees had a chance to connect with Bill on a personal level, asking questions and congratulating him on his mountaineering successes. 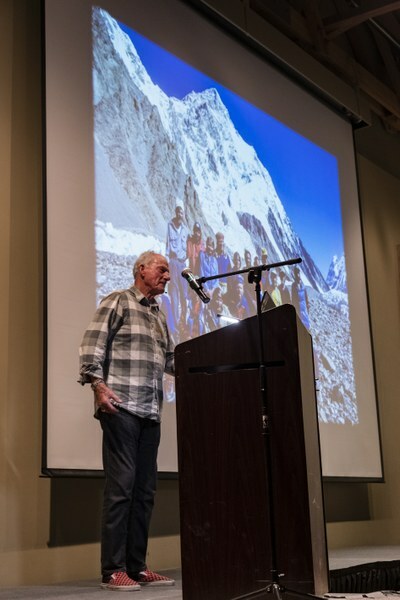 The flagship event of the series brought together 9 members of the original summit team, and was held exactly 40 years to the date of the first American K2 summit. We welcomed 400+ people to this once-in-a-lifetime event, filling our Seattle Program Center to the brim. We launched the evening with an outdoor festival, including delicious food and drinks generously provided by Magnuson Café & Brewery. 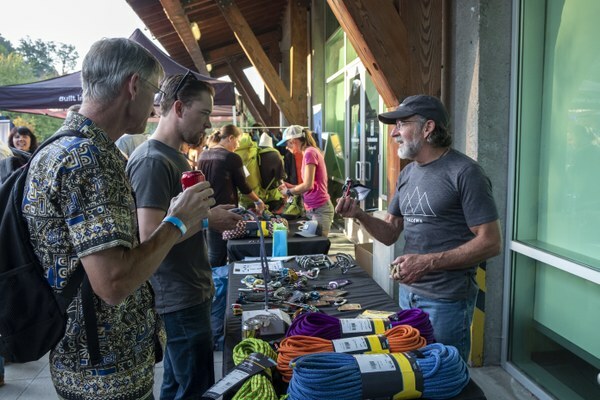 Guests mingled with one another and six supporting sponsors: Bight Gear, Gregory, Osprey, Scarpa, Sherpa Adventure Gear, and Sterling, all who contributed incredible gifts to our raffle. Vibram also had their Sole Factor Van on site to offer guests an opportunity to resole shoes for only $25, with 100% of the proceeds benefiting The Mountaineers. A few of our conservation partners joined in on the fun too, including Access Fund, Washington Climbers Coalition, and American Alpine Club. As the largest nonprofit publisher of outdoor books in the world, we had our team from Mountaineers Books here to support book signings with Jim Whittaker (A Life on the Edge) and John Roskelley (The Roskelley Collection). Attendees learning about the latest gear. By Trevor Dickie. Inside the Vibram Sole Factor Van—at work resoling attendee’s shoes. By Rick Meade. Jim Whittaker and John Roskelley signing books. By Trevor Dickie. Addressing the crowd, Jim Whittaker opened the presentation to a standing ovation, then provided an overview of the expedition, from its conceptualization, to its first trip and resulting failure in 1975, to its success in 1978. The other Jim, Jim “Wick” Wickwire, took the mic and discussed the push from camp five to camp six to the summit, and how he ultimately had to bivouac (camping without cover) in the “death zone,” above 27,000 feet. Chilling audio was played of an interview with Wick and Rick Ridgeway a few weeks after they returned. Wick suffered lung damage and ultimately had to undergo surgery as a result of his unplanned bivy, and his crackly voice brought home the point of just how unforgiving the mountains can be. After intermission, each ’78 climber was given an honorary lifetime membership to The Mountaineers. In a panel discussion led by Vik Sahney, The Mountaineers Board Vice President and accomplished climber having been the first Indian-American to reach the Seven Summits, the climbers shared short personal anecdotes and stories from the expedition—including much laughter and some tears. To close out the event, Big Jim gave an inspirational speech on the importance of the outdoors, exploration, teamwork, and protecting our planet for future generations. Jim Whittaker addressing the crowd. By Trevor Dickie. Bill Sumner on stage with the ’78 team. By Trevor Dickie. Robert Schaller’s family accepting the lifetime Mountaineers Membership in his honor. By Rick Meade. After a summer without a drop of rain (don’t tell anyone), we were dreaming of showing our very first outdoor movie. Of course, being the Pacific Northwest, the dream of projecting a film onto a screen across our south plaza wall was thwarted by the first rains of the season. 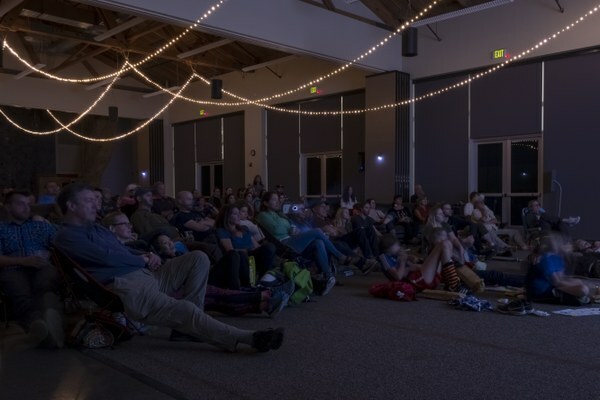 Nevertheless, we brought the sold-out crowd (along with their camp chairs and blankets) inside to enjoy director Jennifer Peedom’s acclaimed film MOUNTAIN, with its unique cinema, musical composition, and exploration around humanity’s obsession with mountains. It was a perfect fit for the K2 motif. 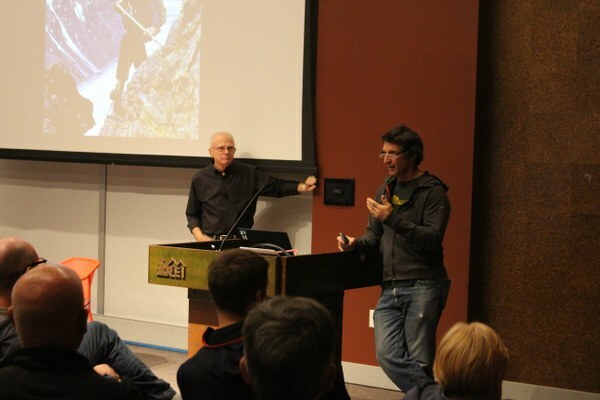 The final event of the series involved a collaboration between The Mountaineers, REI Co-op, and two mountaineering legends, Jim Wickwire and Steve Swenson. You know Wick as a summiter on the 1978 team. Steve was the next American to summit, in an expedition in 1990, and has been climbing in remote regions of the world for nearly 50 years. 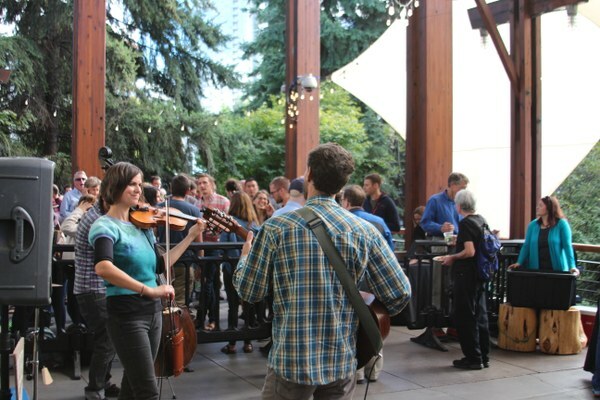 We hosted Beta & Brews at the REI Flagship store, which kicked off with socializing on the terrace, donated Redhook brews, and music by the Killdeer String Band. Guests then went upstairs to hear personal stories about K2 from Wick and Steve, who wove together a fascinating story of climbing through the years in Pakistan. 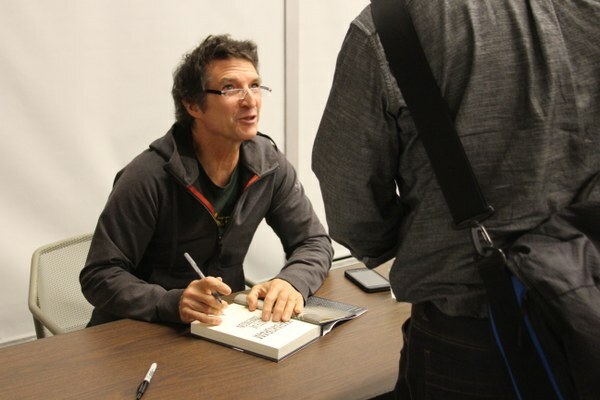 After the stories and Q and A, Swenson chatted with attendees and signed his award-winning book, Karakoram: Climbing Through the Kashmir Conflict. Killdeer String Band playing before the presentation. By Nic Tormohlen. Jim Wickwire, left, and Steve Swenson telling K2 stories. By Tyler Dunning. Steve Swenson signing his book, Karakoram. By Tyler Dunning. We’re thrilled with how well all of these celebrations went—from audience participation, to the generosity from our sponsors and the enthralling stories from the 1978 climbing team, to the smiles on everyone’s faces at the sense of community created by this collective achievement, we are so grateful to Jim for his big idea, and to the entire expedition team, especially Dianne Roberts, for supporting this wonderful K2 series. Throughout the week, nearly 1,000 Mountaineers members and supporters joined us for an event, and thousands more engaged in the occasion through our magazine and blog. It was truly an honor to host the celebration and bring such important stories about adventuring with purpose to our community. 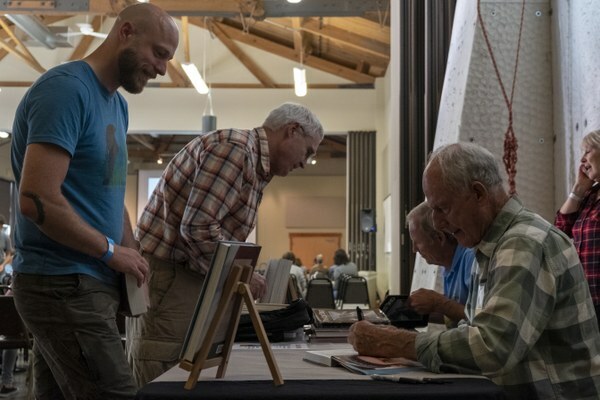 For more information on the expedition, be sure to check out our Mountaineer magazine piece by Jim Wickwire, “K2 40th Anniversary: Inspiration Through Generations”, and Larry Stone’s article in The Seattle Times, “Summiting ‘Savage Mountain’”. Mark your calendar for Saturday, April 13, 2019, when world-renowned photographer and professional athlete Jimmy Chin will serve as keynote speaker at The Mountaineers 2019 Gala: Adventure with Purpose. Sponsorship opportunities are available now. Contact Development Manager, Tyler Dunning (tylerd@mountaineers.org), for more information. Ticket information will be available soon.